Property Developers, Londonewcastle, hope to persuade H&F Council to grant planning permission for a multi-million pound scheme in the heart of Brackenbury Village. They propose to build fifty six dwellings and eleven commercial units which will back onto homes in Dalling, Brackenbury and Goldhawk Roads. Residents have a number of concerns and have arranged to discuss them at a public meeting taking place tomorrow night. Regular readers will recall that the ruling Conservative Administration has used its large majority to grant permission for several controversial major property developments, overruling residents’ considered objections in the process. These include the recent Glenthorne Road scheme, where officers and Tory councillors argued that the property developer’s need to make a profit overrode residents' concerns; the Percy Road scheme, where the Tories voted to allow eight properties to be built a mere three metres away from other residential homes; and the Hammersmith Grove Armadillo, when Ravenscourt Park Councillor Lucy Ivimy (Con) threatened to have residents expelled from the planning meeting for holding up posters. I hope the Conservatives will listen to local people and address the concerns they raise on this current proposal. It’s worth noting that Londonewcastle have hired the PPS Group, a firm of local government lobbyists professing to be the “UK's first and is its foremost supplier of lobbying, communications and consultation advice to the property industry” PPS are best known to local residents after having acted for the developer on the highly contentious Hammersmith Grove Armadillo. PPS have now upset local residents about this scheme by refusing to take part in the public meeting planned for tomorrow evening. The Brackenbury Residents Association invited PPS and the developer along to listen to residents’ concerns and answer their questions. However, PPS have been emphatic in their refusal. Instead, they say they will stage an exhibition earlier in the day. All this begs the question what are they frightened of? What’s the worst that could happen other than some possibly pointed questions from residents keen to find out more about plans for their neighbourhood? Surely, if Londonewcastle’s case is worth putting, it should be put to those people most likely to be affected? PPS and Londonewcastle will have almost certainly been in private discussions with H&F Council for many months. So why not have this conversation out in the open and let local people know what is going on? All this is rather peculiar when you consider that on PPS’ website they tell potential clients that “Active engagement and consultation with the community is what PPS is all about. We’ve been doing it since 1990, and have enormous experience of how to make the provisions of the 2004 Planning Act work for you. Get it right and you can bring the community with you. Get it wrong and you will face heightened local concerns”. Residents tell me that, so far, PPS are getting it very wrong. Maybe they will have a change of heart. 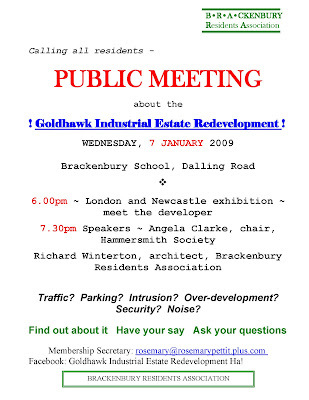 The public meeting has been arranged by the Brackenbury Residents Association and will begin at 7.30pm on Wednesday, 7 January 2009. It will take place in the Main Hall at Brackenbury School, which is situated on the Dalling Road/Brackenbury Road junction in Hammersmith. However, if you can get there for 6.00pm you’ll be able to view the developer’s exhibition as well. Please click here and here to read H&F Council’s consultation papers and view the plans. Click here to register a comment or objection with the Council. Please ensure you click the correct button to indicate whether you are simply commenting or expressing objections to the scheme. For further information about tomorrow's meeting please click here to email Rosemary Pettit, Secretary of the Brackenbury Residents Association. To keep updated, Rosemary has also set up a Facebook group which you can join by clicking here. It has been a pleasure to read such a clear, concise statement of the situation regarding the proposed Goldhawk Industrial Estate development, and it's a relief to know that you're aware of the comments and concerns of local residents. Thank you! I very much hope that your colleagues on the Planning Committee will wish to join you in trying to deal with this application in a way which best serves the needs of our community.